This project evolved out of a conversation I had with my friend and sister Icasiana Barrs. 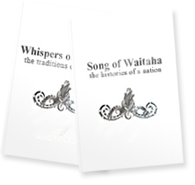 I worked on behalf of the Waitaha Grandmothers with Icasiana of Samadhi Life. We wanted to honour our Beloved Earth Mother in a good way. Mothers Day is perfect is it not? The concepts for the above event revolve around the Waitaha philosophy of the power and sounds of words in karakia (chant, prayer, mantra, meditation). When this is recited in, over, around or across water, the intention of the karakia travels instantly to where it is directed to go. For those who cannot get to a waterway simply recite your prayer and intention over a bowl of water in your home. Know that all water is connected. This is an opportunity for us to show our aroha, love and compassion and gratitude for our Earth Mother and as well include healing for all her waterways. We ask that you begin your karakia at dawn with the words Peace to the Universe, love to the Universe, truth to the Universe, joy to the Universe, Peace to the Universe. Some of you know this as the waiata/song AIO ki te Aorangi so sing it if you wish to, that would be just as perfect. And then place your intention of healing Her waterways. A suggested timeframe could be for 30 minutes to an hour. Imagine the rolling impact around the world this will have for our Beloved Mother Earth. We ask that you share news of this event with all of your friends and relations please. We look forward to meeting you all in spirit at dawn on Mothers Day. Imagine this becoming a daily event. It is that simple, that it is possible, is it not? Think about it, honouring our beloved Mother Earth on a regular basis.